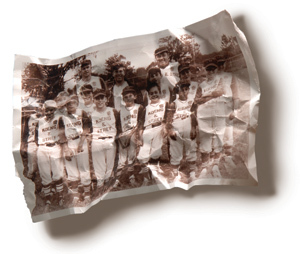 In a softball-filled summer of 2003, an NYU sociologist steps up to the plate, hoping to redeem his decades-old Little League slump. Call me Eddy. I’m not your average baseball-loving professor. Unlike the sweater-wearing talking heads who wax poetical in front of Ken Burns’s cameras, I’m going to be playing ball in New York City this summer, probably on five softball teams. At this late date I am still trying to prove myself. My ball-playing career has been checkered at best. I had a great season as a nine-year-old at the lowest level of the local Little League in our Chicago suburb. I was the team’s top hitter, threw a no-hitter, and played shortstop or catcher when I wasn’t pitching. With the championship on the line, two outs in the bottom of the last inning, I hit a home run. My sterling performance earned me promotion to the major leagues of Little League. In the majors I was overmatched. Between the ages of ten and 12 the other kids grew, but I held steady at four-foot-eight, 65 pounds. In my first season I got no hits whatsoever, waving hopelessly at heaters unleashed by kids with precocious pituitaries. For the good of the team I was relegated to the minimum three outs in the field or one plate appearance. I had plunged from superstar to mascot. I did only marginally better in Pony League, where I was the littlest guy on a losing outfit sponsored by the Optimist Club, whose manager expressed his confidence in my hitting by shouting from the bench for me to bunt. I have a team photo from my Little League days that reveals my plight. I am, of course, in the front row, third from the right, wedged in with the other small kids. My neighbor Stevie, one of the starters, stands directly behind me. A year older and a head taller than me, he has just slapped my cap askew. This exposes my wiry hair, which older teammates would rub for luck, to bond with each other, or just to annoy me. As the shutter snaps Stevie is relating something rudely nonsensical to ensure that I will flash a stupid, metallic grin for posterity. I keep the photo in a frame on my dresser. My change in status was more upsetting for me than it might have been for most. My love for and ability to play baseball were the only things that made me fit in with the other boys. At about the same time that I stopped growing I noticed that they didn’t share my other interests. No boys I knew would admit to liking to read, beyond the John R. Tunis baseball books. I was reading them, sure, but also the Little House on the Prairie series and the diary of Anne Frank. And my love of baseball transported me into territory where others dared not follow, such as devising a fantasy-baseball game with a deck of cards, playing entire seasons and compiling the team standings and player stats. Even worse, I liked school and, once grades stopped measuring penmanship and comportment, began noticeably to outperform my classmates. I had lost the respect accorded a baseball star and minor discipline problem and was revealed to be a very little boy with strange hair and hobbies, and even more suspect vocabulary and math skills. My physical appearance and unorthodox interests made the other boys less likely to befriend me than to separate me from my lunch money. I didn’t reach 100 pounds, or puberty, until sophomore year. After my baseball career fizzled, I tried softball. In Chicagoland we play a “weird and wonderful game,” as sabermetrician and baseball historian Bill James has put it, swinging “a stick at something about the size of your head”—the 16-inch softball. For me the game was not weird, being the only softball I knew, but it wasn’t any kind of wonderful. A new 16-incher also resembles a head in its hardness, and like their macho 19th-century baseball forebears, Chicagoans field with bare hands. The one thing I could still do in baseball was to flash leather, and that too was gone. So it was a revelation when I went away to college at Indiana University and learned that Americans across the fruited plain use the standard 12-inch softball. Right away I sent home for my beloved glove, a USA-made Wilson A2000, and threw myself into intramural softball. I had filled out, at least for me. 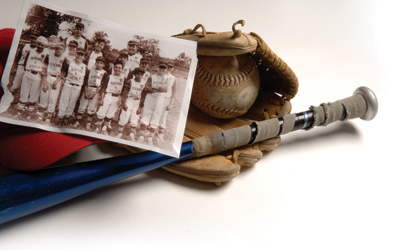 In full uniform, including plastic cleats and bat, I stood five-foot-six and weighed 150 pounds, my curly hair ballooning so far that it repelled the cap, a little like Oscar Gamble. With my elevation to almost standard size, my game returned. After my senior year, I was recruited by a Bloomington slow-pitch team, establishing myself at shortstop and batting .600. I always suspected that somewhere I had retained the ability to play, but it was only arc ball, and soon my time had run out. I was starting graduate school and had to return to Chicago, my hometown, the softball badlands. Seven years later, when I became an assistant professor of sociology at New York University, I was excited about the possibility of playing 12-inch softball regularly again. But I didn’t know anybody in New York, much less anybody who played. On weekends I would sometimes set aside my research and make a pilgrimage to Central Park. There they played a type of ball that reminded me of Little League. The pitchers stood close to the batters and threw modified fast pitch. The fields were always booked by organized leagues stocked with excellent players. Hoping they would notice me, I would stand on the sidelines pounding my fist into the A2000 like a youngster at Yankee Stadium praying for a foul ball, but I might as well have been invisible. In the end, I took an unlikely route to Central Park. After several softball-less seasons, some NYU graduate students invited me to a Saturday-night pickup game in the West Village, a leisurely, slow-pitch event played on a tiny Little League field enclosed by massive chain-link fences. For the next four years I treated this diversion as if it were the World Series and Super Bowl combined, playing a mean shortstop and hitting up a cyclone. The name didn’t last long. Zeus went to Sports Center in the Bronx and saw a set of grey Dodgers-style away jerseys that read “Sharkeys”—no apostrophe—which the company was eager to unload at a steep discount. The jerseys’ selling point for me was that sewn in white on the swooshing tail of the blue tackle lettering was “Clifton, NJ”—a location that offered an air of menacing industrial decline. None of us had even heard of Sharkey’s, which is apparently a sports bar, but we adopted the name on the jerseys, typo and all. Our opponents were not intimidated. During my three years on the Sharkeys we lost two-thirds of our games—a record of haplessness reminiscent of the early New York Mets. Though I played well, my non-power game is not the kind that earns much notice or credit. I had been quarantined to a desolate northern New Jersey of softball. I was playing so little that I had time most summers to train for the New York City Marathon. But last season, despite having my best years well behind me and shrouded in a loser aura, I was discovered as a softball player. Getting onto an organized softball team in Manhattan is next to impossible. There are tens of thousands of potential players but only about five places to play. And anyone who is invited onto a team is, usually, in for life. It is less like a dugout pass than an appointment to the federal bench. Recruitment is based partly on merit but mainly on word of mouth, herd mentality, and serendipity. This is where Billy comes in. Billy plays guitar for a theme band but, like Zeus, is a softball impresario, a pitcher on four teams who devotes most of his waking summer hours to the game. When the Saturday pickup game was moved temporarily to the spacious East River fields, Billy learned that I could chase down fly balls. This was sheer luck. He had seen me play many times in the West Village, where there is no outfield to speak of, and had never considered recruiting me. But now, looking for versatile players that he could deploy at any position, he asked me to join a highly skilled Sunday men’s team called the Nuclear Pencils, in the Lower Manhattan Softball League, and recommended me to the managers of two competitive coed teams: Thespian Aid, in the Broadway Show League, and d.b.a., the defending champion in the East Village Softball Association. With the gates to New York softball at long last opening, I was ready to break out. I began the season leading off and playing third base for the Pencils. In the second game, our shortstop Mike—of the many softball-playing Mikes in New York, the only one I know who rates the honor of being called simply Mike—waved Billy over after I had made an error. He told Billy that I didn’t “look comfortable” at third base—softball code for “Get him out of my infield.” I was exiled to right field, and soon to the bottom of the batting order. Before I could play my way back into the team’s good graces I injured myself. I had qualified for April’s Boston Marathon and decided to run in it, but without the usual extensive training I cramped up badly on Heartbreak Hill and limped to the finish. Soon afterward, I popped my hamstring trying to stretch a single, then aggravated the injury trying to come back too quickly. Although I wasn’t kicked off the team, I was now riding the pine. It was like Little League all over again. I had made good with the Sharkeys in the less competitive weekday league, had been promoted to the weekend league, where the big kids—people with regular jobs—play, and had faltered. I feared that my new teammates would start rubbing my head. Now it has again turned spring. With a new season of softball, I have a rare opportunity. How many of us have wanted to redo something we failed at as children? I also have a sense of urgency, like a baseball general manager in a small market with a roster of stars on the verge of free agency. I’m on the far side of 40, and despite a winter of rehab my hamstring still isn’t right. The beautiful and brilliant Francesca has persuaded me that it’s time for us to have a baby. My playing ball all summer is part of the deal—next year I will probably be pushing a stroller instead of swinging a bat. Like any GM who trades for known quantities and relinquishes prospects, I wonder if I’ve given up too much. On top of all that, Francesca is up for tenure at Columbia. If she doesn’t get it, we may have to leave New York. And this winter I was elected chair of the NYU sociology department, a three-year term that starts in the fall. So this season I am going to play softball nearly every day and twice on Sundays. I will also get my first chance to run a team—the doormat Sharkeys. I’m looking forward to the challenge. This season may be my last chance to avenge my Little League humiliation. Excerpted from Professor Baseball: Searching for Redemption and the Perfect Lineup on the Softball Diamonds of Central Park by Edwin Amenta, published by the University of Chicago Press. © 2007 by the University of Chicago. All rights reserved.